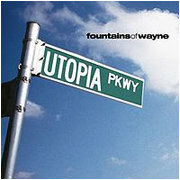 Review: ‘Fountains of Wayne’ is unquestionably the best band ever named for a lawn ornament store in Wayne New Jersey. In 2003 they were nominated for a Grammy “Best New Artist”, which is fittingly absurd, since the band’s first album, the self-titled “Fountains of Wayne” was released in 1996. I love all their stuff, but my favorite has to be the ’99 release, “Utopia Parkway”. Riffing on various musical styles from the seventies through nineties, the songs are funny as hell, but they’re more than parody. The lyrics capture the stoner insipidness of a wasted New Jersey youth, but always from a first person point of view. The end effect creates a mental bifurcation. You laugh at the characters stupidity while sympathizing with how completely unstupid you felt when you did the same things. “Prom Theme” unstintingly describes the emptiness of high schools final ritual, but from the inside, where you felt like it was some huge, important deal. “Laser Show” isn’t just a power ballad about idiot youth smoking dope and going to see ‘Dark Side of the Moon’ in a Planetarium stuffed with like minded losers, it’s about how awesome it felt to BE in that car, on the way to that show, with your best buds none of whom had any idea how to get a date any more than you did, and who years from now you’ll wonder why you hung out with at all, but MAN, you loved them then! “Red Dragon Tattoo” isn’t just about a dope getting inked ‘cause he thinks a girl who’s out of his league might take him more seriously, it’s about being that guy and having no idea at all it isn’t going to work. Despite not knowing the band I read the article until the very end because this looks interesting, although the last line didn't seem to survive until the last period. This is an album I have listened to and liked for years. Yay, I'm a little bit like Max Burbank.